Engineers at Tel Aviv University in Israel reconfigured common computer chips into high frequency circuits, making them useful for building low-cost security imaging devices. Eran Socher, a lecturer in Tel Aviv’s engineering department, is leading the university’s research team that published its findings in a recent issue of the journal IEEE Microwave and Wireless Components Letters, and will present a paper at the International Conference on Infrared, Millimeter, and Terahertz Waves in Australia later this month. The work of Socher and colleagues addresses the need for simple, smaller, and more ubiquitous systems to make more feasible the task of detecting hidden weapons or explosives at events or in transportation centers. Current detection systems tend to be large in size and price, which limits their use to larger airports. The Tel Aviv team starts with existing complementary metal-oxide-semiconductor (CMOS) chips designed for computers and mobile devices. Socher and colleagues take CMOS chips, measuring a half-millimeter square, and add antennae with the ability to broadcast and receive signals in millimeter wave and terahertz radiation frequencies. Millimeter wave is used in some of the current airport scanners in the U.S., while terahertz radiation can pass through materials such as clothing, paper, cardboard, and wood. 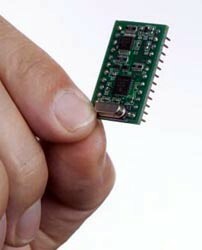 The reconfigured chips would still need to be integrated with scanning technologies to produce an image. The radiation from the chips, however would, unlike X-rays, not penetrate human tissue, and operate at radiation levels lower than mobile phones. Socher says the chips can produce as well a more accurate depiction of concealed objects than common metal detectors that only indicate the presence of an object. The researchers have received funding from the Broadcom Foundation in the U.S. to continue their work. Socher adds that software and communications companies have already expressed an interest in the technology.